Updated 04.09.2018. 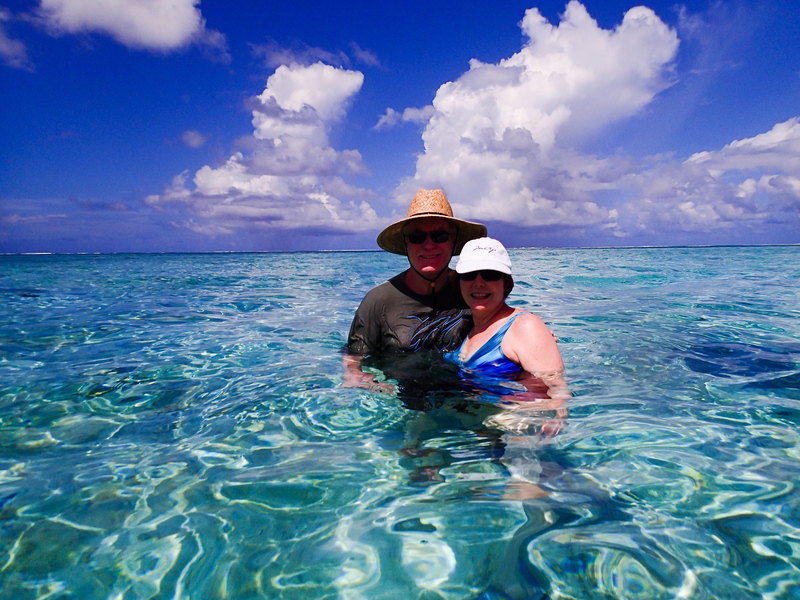 When it comes to luxury cruises for boomers, Alan and I know our stuff. We’ve been sharing advice with you since August 2014, but our luxury cruise experience dates back to 2001. With more than 300 cruise nights onboard small luxury cruise ships like Seabourn, Silversea and Regent, we really do KNOW cruising, which is why we’ve created this luxury cruise planner. Use it to make the most of your next boomer cruise. Be sure to come back often as we continue to update and verify our advice, recommended online resources, and products for you. Or subscribe to the My Itchy Travel Feet Weekly Broadcast to be the first to know! 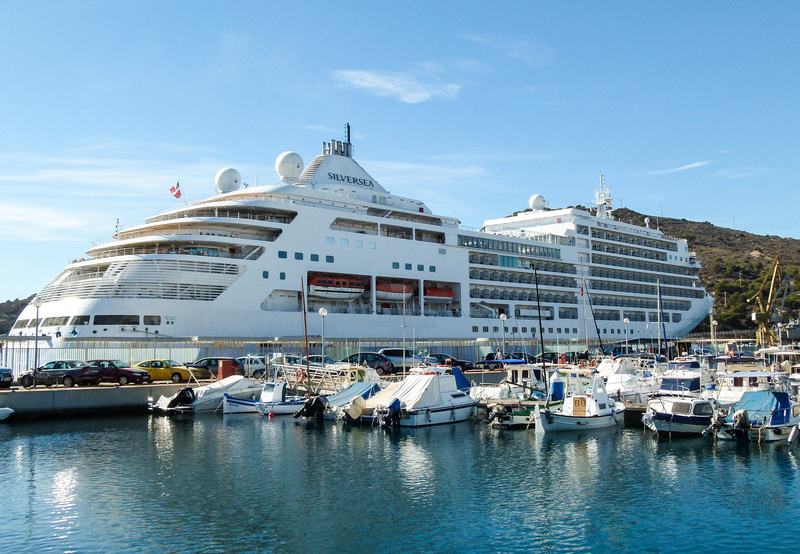 Luxury cruise ships call on smaller ports. Who doesn’t have questions about luxury cruising? After all, boomers and senior cruisers are spending a lot of money and time on cruising, so of course you want the best experience possible. We’ve anticipated your questions to help in the planning process. How will I know if luxury cruising is for me? Reading first-hand reports is one of the best ways that we know of to get a true picture of a luxury cruise experience. And that’s what you’ll find at our luxury cruises for boomers page. Considering the number of cruises that we take (paid for by us, except for an UnCruise in Alaska), this page is a constant work in progress, so check back often. Should I use a travel advisor? Absolutely! Our number one piece of cruise advice: use a travel advisor or agent who is an expert in the cruise line and type of cruise that you’ve chosen—this advice rings true no matter your budget. A top seller for a cruise line has clout. He or she can answer your questions because they really know the cruise company. Or they know the perfect person to contact to find the answer for you. Top advisers for a cruise line also offer perks and special benefits that only they know about. And if you experience a problem, it always helps to have someone with clout on your side. Will I enjoy long cruise itineraries? We love long cruises. And, rest assured, they are not boring as we share in our Transatlantic cruise tips. A 2-week cruise with all ports allows no time for enjoying shipboard amenities. And believe us, you’ll experience plenty of amenities on a small luxury cruise ship. Alan and I prefer itineraries that are 21 days or longer for their abundance of sea days, but it helps to have a strategy for surviving a long cruise. How can I save money on a luxury cruise? A budget-friendly way to experience your first luxury cruise is by booking a crossing because you’ll usually find 2 for 1 pricing. We share advice about crossings in the article: all you need to know about a Transatlantic Cruise. A cruise adventure always puts a smile on my face. Which cruise itinerary is best for active luxury travelers? How long do you have to read this? Seriously, base your choice of cruise itinerary on which part of the world you want to see, then check out itineraries offered by your favorite line, followed by the specific small luxury ships that you enjoy. Having said all that, there are some destinations where luxury cruising really shines. Why? Because small ships can take you to those off-the-beaten-path ports that the big ships can’t access. Have you cruised to Alaska? Did you stand on the dock in Ketchikan watching all of those big ships disgorging passengers? If you prefer a more intimate experience, follow our advice in how to choose the best Alaska cruise for you. Did you know that we’ve cruised the South Pacific five times: twice on Regent, a 62-day extravaganza on Silversea and twice on Seabourn? The mix of tropical ports and sea days combines into one luxurious trip. We’ve gathered advice about ports, planning and apps into one cruise travel resource for you: South Pacific Cruising Guide. Would you like to include adventure in a luxury cruise? 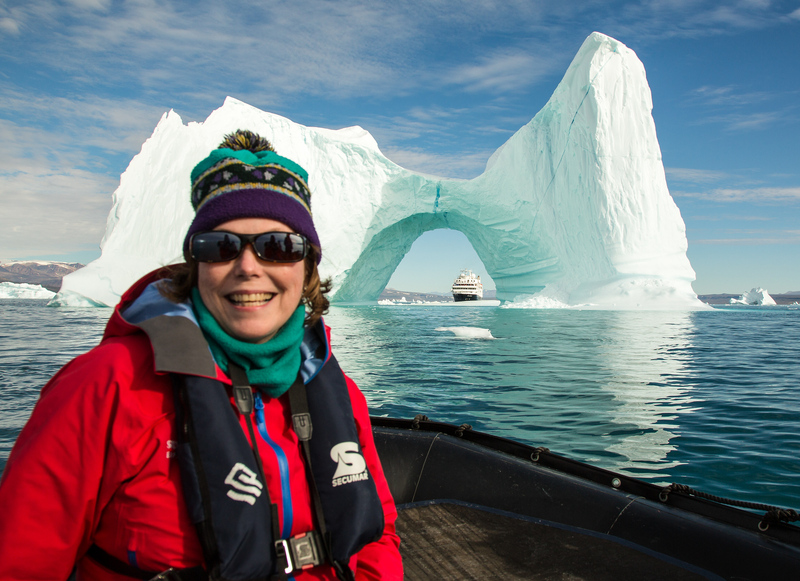 Expedition cruising is the way to go and the choices are expanding each year. We’ve cruised the Arctic on Silver Explorer (Silversea)—think luxury, adventure excursions and no formal nights. If Antarctica is on your list, we answer 6 questions about cruising to Antarctica. Alan and I especially enjoyed an Antarctica cruise on Seabourn Quest, a wonderful combination of regular luxury cruise (yes, there were formal optional nights) and adventure excursions. What a way to celebrate Christmas and the New Year! What about the ports? Should I book with the ship or plan my own shore excursion? My question back to you would be, have you visited the port before? If it’s a port that we’ve visited before, Alan and I like to do our own thing. That might mean strolling into town, booking with a private guide or signing up for an independent tour. If you’re cruising around Europe, make sure to check out my recommendations for Six European Ports to Explore on Your Own. Want to book an independent tour? We recommend Get Your Guide. Another good choice is Viator. In exotic destinations, we prefer to take the ship’s shore excursion. And often luxury cruise ships offer special experiences in a port that you can’t book on your own. As far as cruise excursions, we’ve experienced hundreds, most of them booked through the ship. Reading our shore excursions page will help you decide which one is right for you. And, if you’re stuck on that never ending ride with grouchy cruise guests, you’ll be happy that you read 9 Tips for Surviving a Cruise Bus Excursion. How do I prepare for a luxury cruise? I’m asked this question quite often, especially when it comes to packing and dress codes. 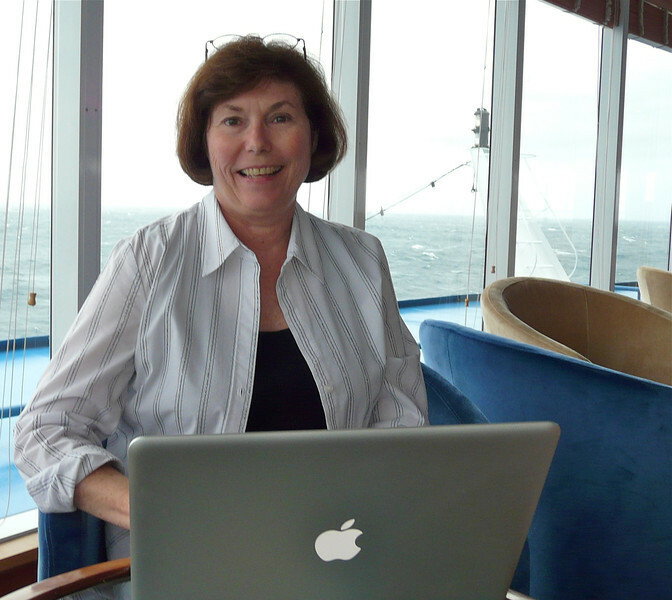 I’m in the process of writing a series of articles about cruise fashion so check back often. Until then, read about how I updated my tropical cruise gear and my favorite personal item bag. What about luggage? Should you send it ahead? Read about our experience shipping luggage to our cruise ship. How do I stay healthy on a cruise (and safe)? With so many days at sea, my advice for staying fit and active on a cruise is to plan a strategy for eating healthy while on a cruise. You can’t travel if you aren’t healthy. I learned that the hard way when a back injury caused my early return from a Christmas markets river cruise in December 2012. That’s why Alan and I dedicated 2013 to getting healthy and staying that way. Read our tips at the One Healthy Change page. What do you do if there’s a disaster onboard? Our article, 10 Tips for Surviving a Cruise Disaster, recommends creating your own escape plan. Follow my advice for how to plan your luxury cruise. After you’ve booked a luxury cruise with a travel advisor, it’s time to start thinking about how and when to arrive and depart. If you’ve opted out of any pre or post land extensions offered by the cruise line, it’s your job to book flights and hotel accommodations. Alan and I arrive at the embarkation port at least a day early, even earlier if it takes a long international flight to get there. Due to the tight supply of airline seats on any given day, we don’t want to risk a plane delay that causes us to miss the ship. We search the best rates in flights with Skyscanner . Be sure to download their app for researching while you’re on the road: Skyscanner iOS App Download or Skyscanner Android App Download . If the choice is between an international carrier or a U.S. airline, Alan and I usually opt for the international carrier, as along as it’s a well known one with a good safety and service record. As luxury travelers, we prefer to fly business class. But rather than play the miles game, we book with a credit card that pays us money back. That refund check is much easier to use than frequent flyer miles. For accommodations, we conduct a hotel search at HotelsCombined for where to stay before and/or after the cruise. As I wrote earlier, arriving at the embarkation port at least a day or two ahead of time is our preference. Usually at the end of a cruise, especially the long ones, we’re ready to come home as quickly as possible without staying overnight in the port. Of course we purchase a trip insurance policy at final payment of the cruise to cover medical—including pre-existing conditions for ourselves and immediate family members—and trip cancellation coverage. Currently, our provider of choice is Generali Global Assistance, previously CSA. We had a wonderful experience with CSA the one time that we actually had to file a claim. Medicare will not cover you on an international trip. And we would never leave home without confirming that our medical evacuation membership with Medjet Assist is up-to-date. Most travel policies will take sick or injured travelers to the closest hospital but that could be many miles from home, costing you thousands of dollars to arrive at your preferred hospital. With Medjet, once one of us is hospitalized, they’ll fly us to any hospital that we choose, either in a medical transport plane or escorted on a commercial flight by a travel nurse. 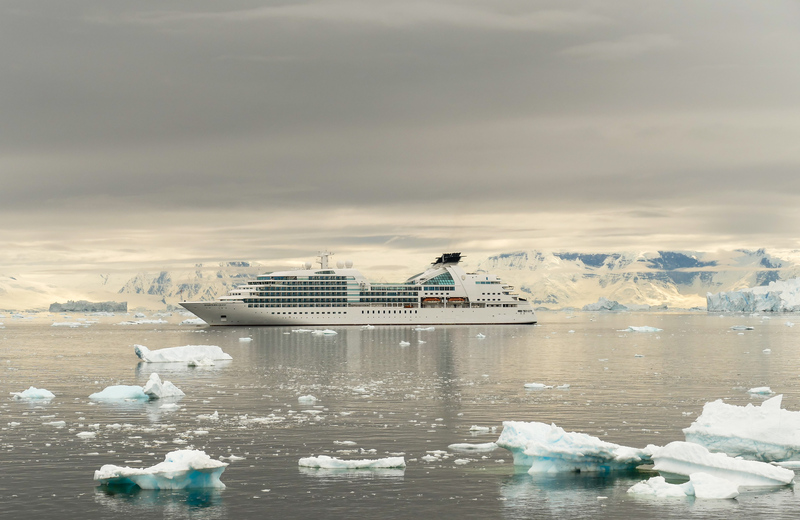 What a surreal scene as Seabourn Quest anchors in Antarctica. Using our years of luxury cruising experience as a guide, we’ve compiled a list of favorite cruising resources so keep reading. Cruise Critic, in our opinion, is the most comprehensive cruise site on the Internet. You’ll find reviews, forums and advice on every cruise line and type of cruise. Luxury Cruise Talk is our go-to forum for discussing luxury cruising, especially Regent, Silversea and Seabourn cruise lines. Avid Cruiser shares cruise reviews, port profiles and more. We especially enjoy Ralph Grizzle’s real-time reports from luxury cruise ships. CruiseReport and CruiseCal show just how many cruise ships will be in port while you’re there. We check this information before booking a cruise. Who wants to be in port with thousands of other cruise travelers? MaritimeMatters keeps us up-to-date about cruise industry news. And don’t miss the My Itchy Travel Feet Cruise Excursions page or Luxury Cruise Reviews based upon our personal experiences. Now do you see why we love the South Pacific? Look at those colors! While online research is easy and convenient, Alan and I still enjoy sitting down with a good book to research cruises. Of course, we load them into Kindle, when we can, for easy access while on the ship. Not only do we avoid those pesky shipboard Wifi charges (if the ship still charges), but accessing them is so much easier than dealing with a slow Internet signal. Lonely Planet Guide Books are a great place to begin your port research. Berlitz Cruising & Cruise Ships 2018 by Douglas Ward is a comprehensive look at cruising and cruise ships. We reviewed the 2010 version of this book. Rick Steves’ Mediterranean Cruise Ports helps you explore Mediterranean ports independently. Fodors Travel Guides for Cruise Ports and other cruise guides are on this page at Amazon. Since travel guides rely upon personal preferences, we’ll leave the choice up to you. Boomer travel tip: read the reviews carefully before making your purchase. And, who knows? One of these days we’ll be linking to our own cruise excursion review books. After all, we’ve been there and done that. 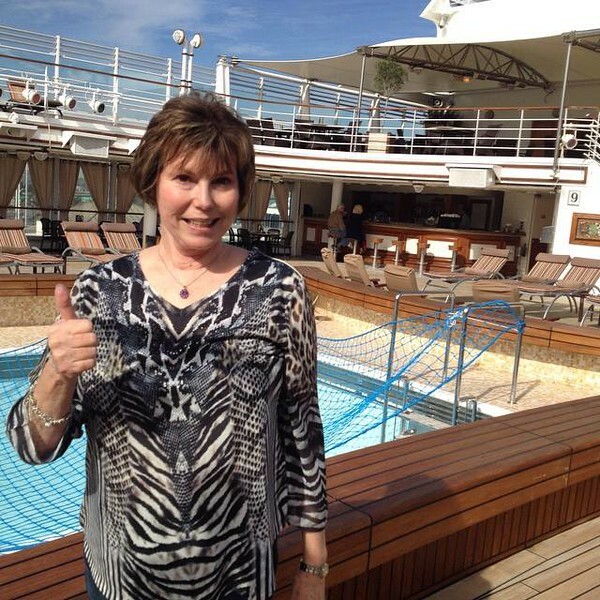 Giving the thumbs up to the beginning of a 62-day South Pacific cruise. We’re often asked what to pack for a luxury cruise. Our answer varies. If you’re traveling on an expedition cruise, you’ll need outdoor gear, with just a small selection of outfits for dinner. Over the Door Shoe Organizer: If you’re in a luxury cruise cabin that’s on the smallish side, I’m thinking of the veranda cabins on Crystal or almost any expedition cruise cabin, with the exception of Silver Cloud, an over the door shoe organizer will save space in the bathroom. Hang the shoe orgaznier over the inside of the bathroom door to conveniently store toiletries. At the end of the cruise, give the shoe organizer to your cabin attendant for his or her use. Universal 3-Outlet Power Strip and Surge Protector: Cruise cabins never have enough electrical outlets for today’s wired traveler. We like this power strip because of its long cord and versatility—the universal socket accepts plugs from any country and the 100V – 250V is great for worldwide travel. My favorite personal item bag packed and ready to go. Scala hat: Hats are a must for sun and wind protection. Scala hats are packable and they’re great for bad hair days, too. Our recommendation for men? Wear your favorite baseball hat or buy one on the ship as a souvenir. Sketcher shoes that double for walking in port and working out in the ship’s gym: If you’re looking for a comfortable pair of shoes for active cruise excursions, check out this pair of Sketcher shoes. I prefer to leave my good workout shoes at home. These are sturdy enough to make-do as a gym shoe, plus the stretch knit is completely breathable for warmer climates. 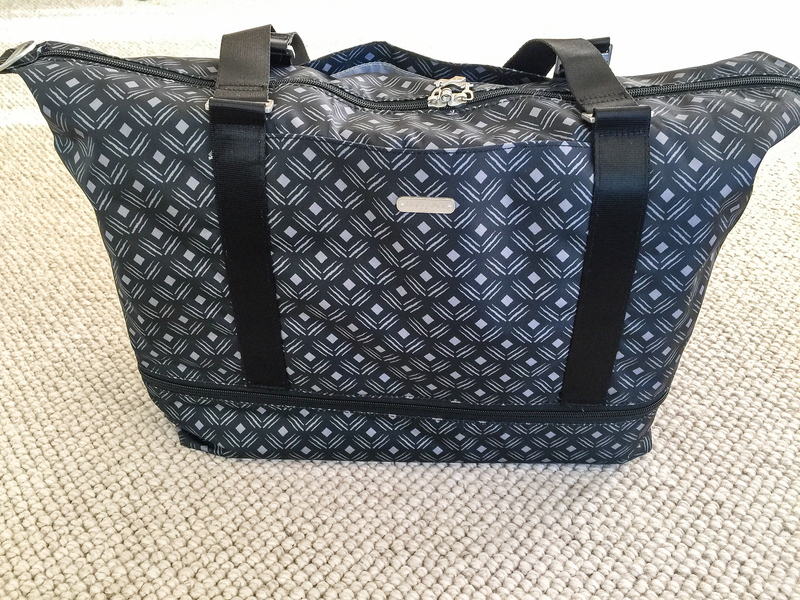 Baggallini expandable carry on duffle: This is the cutest personal item bag that in no way resembles a duffle. I like that it expands vertically rather than horizontally so that the bag fits easily underneath the seat of the plane, or in the overhead. If you’re a shopper, expand the duffle on the way home to bring home those treasures. Eagle Creek Travel Gear Packing Cubes: I converted to packing cubes after using them during my 18-day traveling in a carryon challenge, I’ll never travel without packing cubes. They keep me organized and save room in the luggage. FREE Kindle Reading App : E-books are such a space saver. Alan and I both download books to our Amazon Kindle reading app before leaving home. 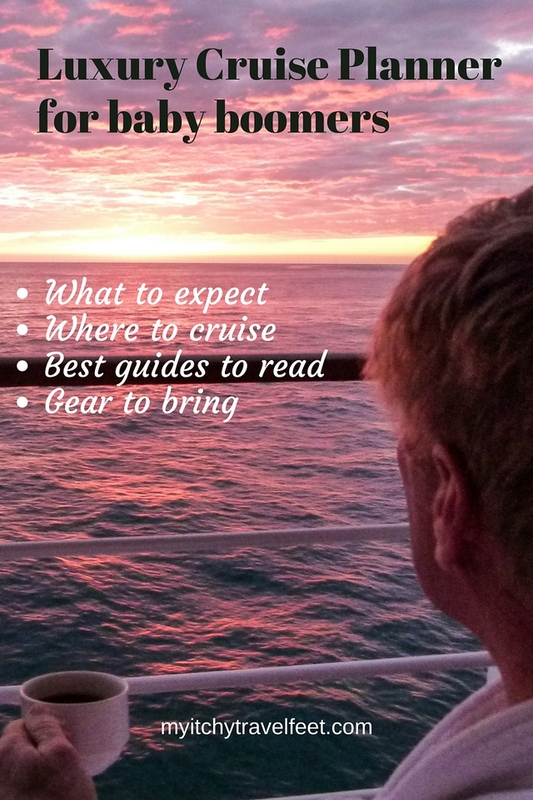 Click over to the My Itchy Travel Feet Boomer Travel Gear shop to discover more of the cruise gear that we use and recommend. Check back often as we update and add new products. Have we given you enough ideas for planning your trip? Check back as we continue to update our resources and advice so that you have the best boomer travel possible.